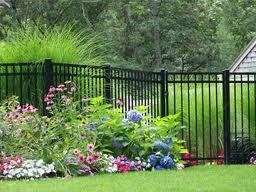 Why Choose an Aluminum Fence in Springfield, VA? Made of hollow, heavy gauge tubes, an aluminum fence is actually single pickets attached to horizontal rails, forming an individual panel. This modular panel construction is lighter, simpler to install and more durable than a similar looking wrought iron fence. With positive similarities, significant advantages, and an affordable price, aluminum fencing is a natural alternative to wrought iron. Many an aluminum fence replicates the delicate details of ancient decorative iron fences. The difference? Fabricating aluminum material makes a fence that is stronger, more durable, and consistently more attractive. An aluminum fence in Springfield, VA will beautifully endure extreme weather, dirty pollution, harsh chemicals and the punishing environment all while providing decorative security for your home. Aluminum is the most commonly recycled metal the world over. Any finish or coating process used should be environmentally safe to promote a virtually pollution-free manufacturing process. As a matter of fact, all aluminum fence installations completed today use aluminum fence products that offer lifetime guarantees against defects in workmanship and materials, and some come with unconditional warranties against cracking, peeling or chipping. Why choose an aluminum fence in Springfield, VA? Contact the fence installation professionals at Hal Co Fences and Decks to discuss the most compelling reasons why an aluminum fence will add so much value to your Springfield home. This entry was posted on Thursday, October 31st, 2013 at 3:11 am	and is filed under aluminum fence, Fences. You can follow any responses to this entry through the RSS 2.0 feed. Both comments and pings are currently closed.